If I could choose to live in one place forever, that would be a bakery. I often like to imagine myself living in a home built upon my own bakery. I would wake up early in the morning to proof bread, mix batter for blueberry muffins, and make chocolate chip scones, and hopefully not eat all of the baked goods before I opened the doors for customers.There’s something so comforting about the warm scent of yeast and fresh bread baking. I would also wear a gingham patterned apron, because those are the cutest, and my hair in a messy but elegant knot tied by a pretty patterned scarf, and I’d own a pastel pink stand mixer…but I’m digressing. However I do wish that I have a bakery one day, and I wake up to birds chirping (yeah right with a toddler) to make fresh bread and home churned butter. 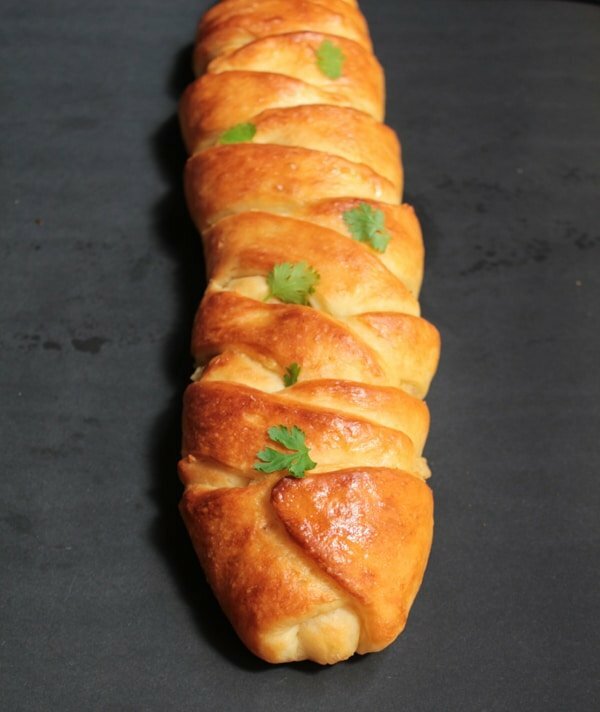 One of the breads that would be sure to feature in my bakery, would be this braided bread stuffed with a chicken filling that’s been bathed in creamy white sauce and earthy coriander goodness. 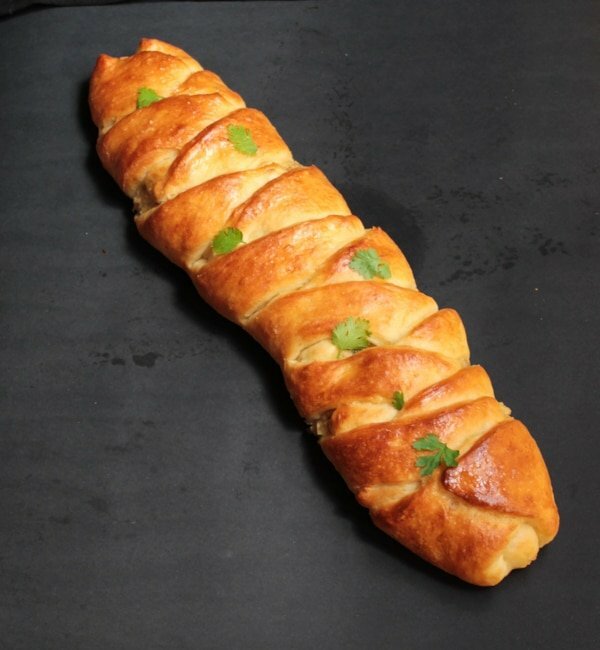 I’m not entirely sure where this bread originates from, but all hail to the baker who came up with this deliciousness. 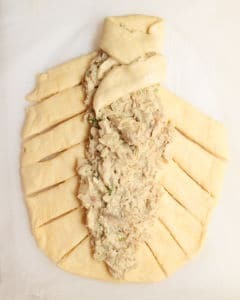 I mean, it really can’t get better than a heavenly bread package that carries inside itself a creamy chicken filling, right? 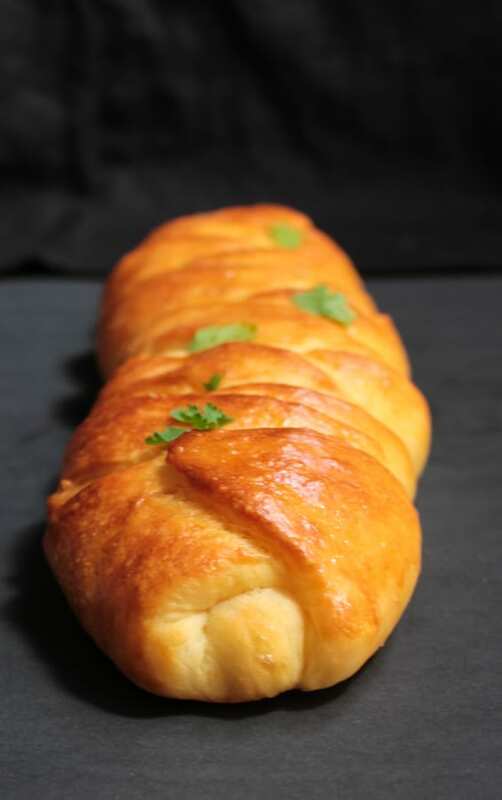 The first time I had chicken bread was a few years ago from a small bakery in Islamabad. It was a life changing moment. It was love at first taste, you could say. The bread was goldeny-crusty on the top, fluffy on the inside, and the chicken filling was creamy and spicy.I wondered for a long time as to how on earth the baker had braided the bread to look so beautiful, almost like a baked version of Rapunzel’s hair, but obviously made out of dough and not hair, because that would just be awful. A few years later, I came across this recipe while I was busy scrolling (stalking people – in an uncreepy way, obviously) through my Facebook news feed, and my eyes landed on this beauty. After years of wondering about the braiding technique, I now had the recipe. I could finally die in peace. Dramatic much? 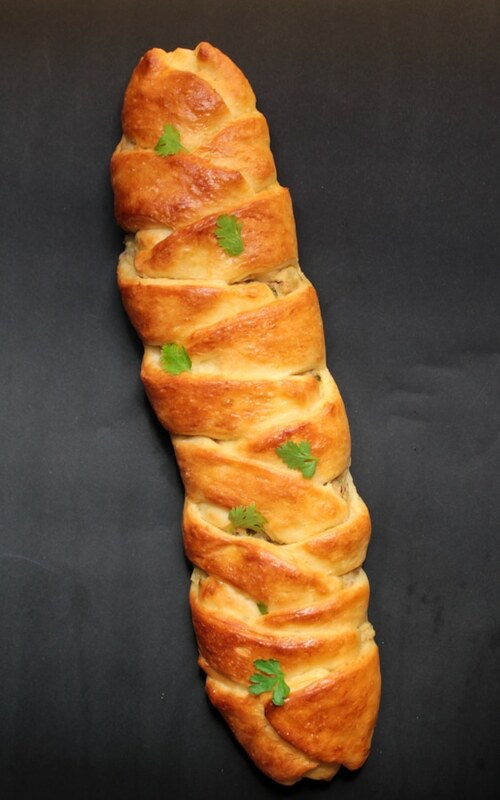 Okay so the braided design of the bread was surprisingly easy to make. I’ve added a visual and step-by-step guide below to explain how the braided design is achieved. I prefer to knead the dough for this bread by hand, because there’s something so homely about it.I love the feel of the dough against my hands. But if you want, you can use your stand mixer with the dough hook attachment. By the way, don’t be scared of the yeast involved. It’s nothing to be scared of at all, you can do it! Just make sure the water is neither too cold nor hot. Because incorrect temperature of the water is what kills the yeast, and we don’t want any yeast killing involved, or else there will be no rising of the dough and then there will be no yeasty-bread scent wafting across your home and that would be a travesty. 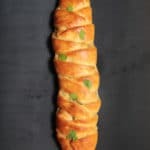 This bread is perfect for tea parties and impressing your guests with your clever abilities to make complicated braided breads that are stuffed with creamy coriandery chicken goodness. I like to serve this with spicy garlic ketchup, but you can serve it with any condiment of your choice. Now I’m off to dream about my alternate baker life. Happy kneading! In a large mixing bowl combine 4 cups of flour, 1 tablespoon instant yeast, 2 tablespoon milk, 1 teaspoon salt, 4 tablespoon oil, 1 egg and 1 teaspoon granulated sugar. Form the dough by slowly adding warm water. 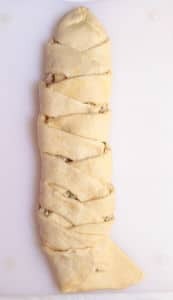 Be sure to do this gradually, as you don't want a very wet dough. 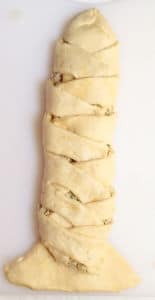 Knead the dough for about 10 minutes until it is soft and springs back at the touch of a finger. 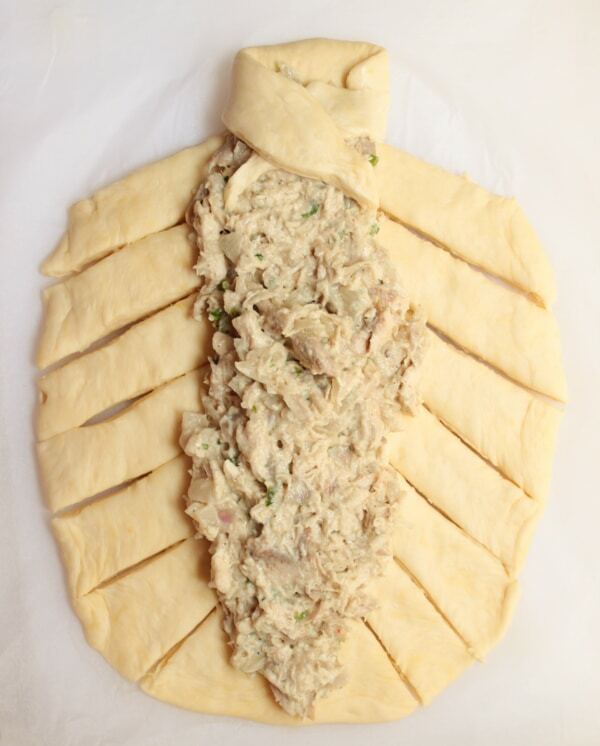 Cover the dough and let it rise for about 1 hour in a warm place nearby the oven. 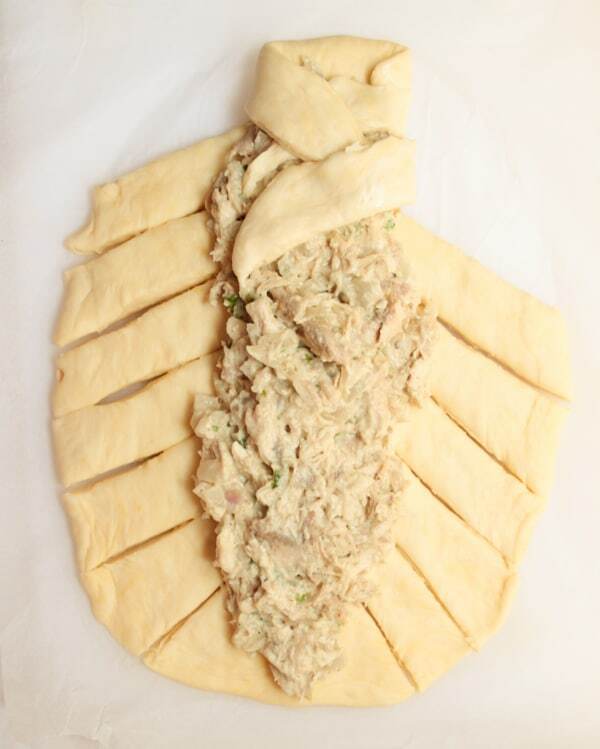 While the dough is rising, prepare the chicken filling. In a medium sized saucepan, add 2 tablespoons of butter and 2 chopped red onions. Cook the onions till they are just translucent, we don't want any color on them. Add 2 tablespoons of flour and let it cook for about 1 minute while stirring continuously. Pour in 1 1/2 cups of milk and stir slowly until it becomes thick. Add the shredded chicken, coriander, green chilies, black pepper and salt. Let cool. 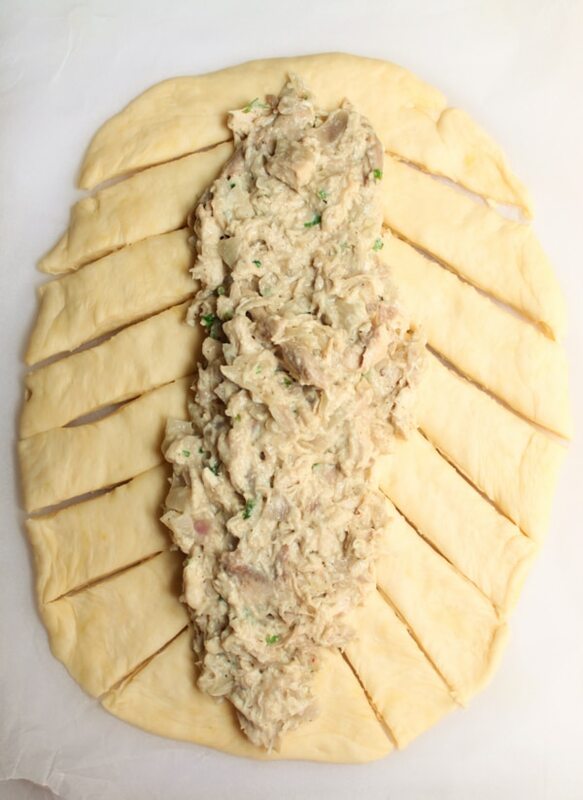 After the dough has risen, divide it into 2 equal sized balls. 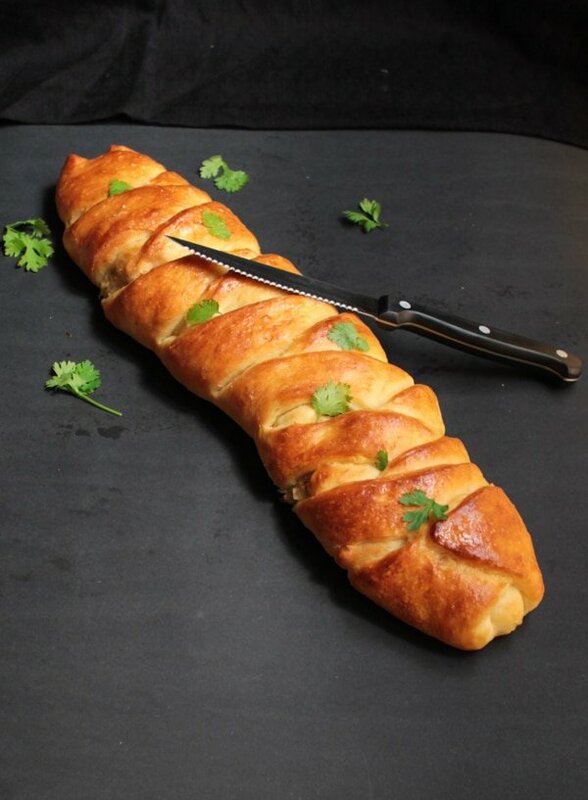 Roll one dough ball into a rectangular shape. Brush some melted butter over it. 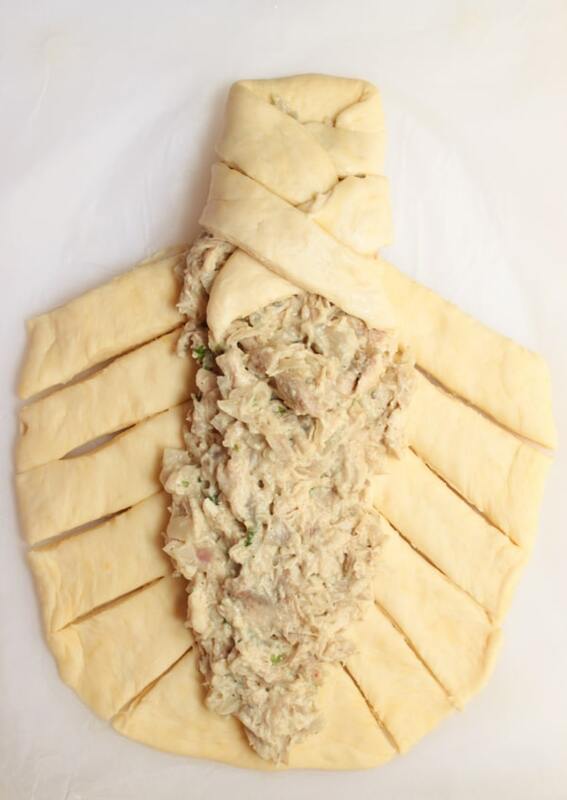 Put your cooled chicken filling in the middle of the rectangle and cut diagonal slits on the longer sides of the rectangle. Fold over the slits in a criscross fashion, neatly folding at the end. (Refer to to the pictures below to see the method). 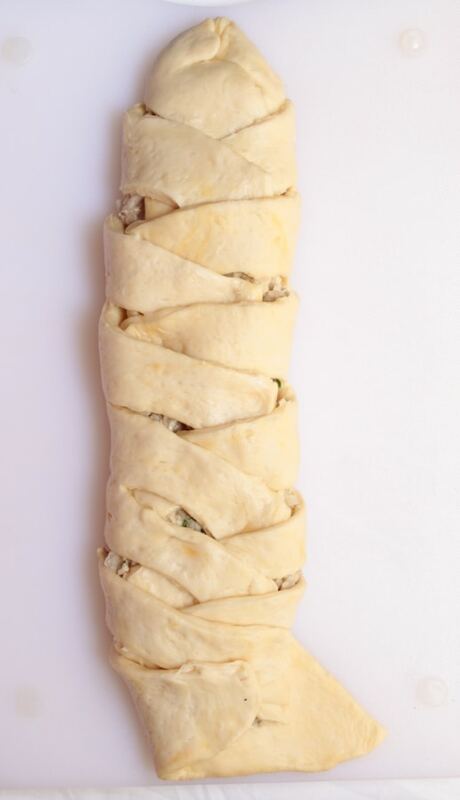 Repeat this for the second dough ball. 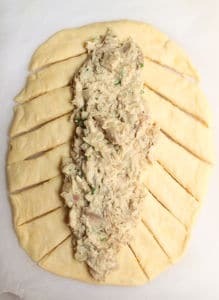 Place the breads on a greased baking tray and bake for about 30 minutes or until the crust is golden brown. Enjoy with chili garlic ketchup! Oh my god this looks excellent and now it’s stuck in my mind. 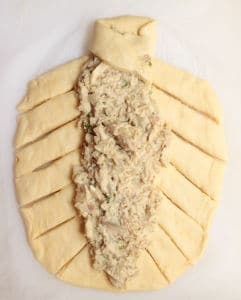 I have to make this, I really have to! Though too late but tried your recipe yesterday and it turned out extremely beautiful and yummy!!! Hi Meera! There might be a couple of reasons for that. Did you bake it for too long perhaps? Or could it be that you didn’t knead the dough enough? The bread should have a slight crust on top, but be soft in the middle. I hope this helps! Okay I really want to try this! I have what may be a stupid question but ultimately is the reason I buy yeast of all kinds(lol) and yet end up throwing it out because I’m never sure when a recipe calls for it whether or not to dissolve it in water or not…..so please somebody tell me for this recipe so i can make it! I have always wanted to bake a loaf of bread, always thought it was a mammoth task until I came across your recipe! I suprised myself when I saw the end result. It not only looked professional but tastes so good! This is an amazing recipe! Every time I make this, people go gaga over it. Thank you so much for sharing this recipe. Have tried making with cottage cheese cubes as well. Turns out equally good.